Milk Stouts don’t contain milk, they do contain Lactose, and all things being fair they did contain milk until brewers found out how to get the sugars (lactose) out of the milk. 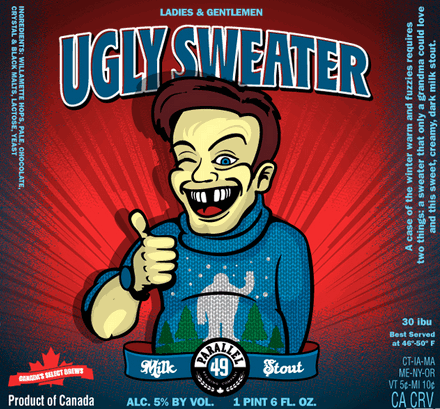 So brief history lesson aside how is this Milk Stout Adorned with very happy man who himself is adorned with a very ugly sweater? It pours dark with a toffee coloured head. The sip is dominated by a sweetness that is quite creamy and mouth filling reminiscent of dairy desserts. The stout is notable for lacking the strong roasted flavours that many stouts have, but thats to be expected given the style. This is a fine milk stout and likely the most readily available too. I actually had this at the pub the other day and was disappointed. Having had from the bottle right now i believe the beer from the bhp must simply have come through gross beer lines, tainting the flavour. Previous Article Mystery Gift: a Retrospective. The crazy part is I have a bit of a lactose intolerance but it has never bothered me in a beer. Not sure how that is the case.